Dark Souls II: Scholar of the First Sin is being billed as "the most complete version" of the game by Bandai Namco Bandai. It collects all of the content previously released as DLC, as well as enhancements for DirectX11 including improvements to graphics, sound, and performance, an increase to the maximum number of online players, and new weapons and armor. It all sounds very good—and then you get to the pricing strategy. 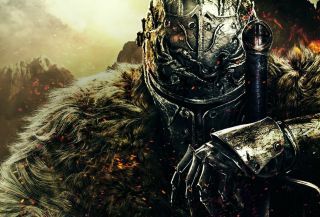 The DirectX9 version of Dark Souls II: Scholar of the First Sin will sell for $40, while the DirectX11 version will be $50. If you already own Dark Souls II on Steam, you can upgrade to the DirectX11 edition of Scholar (since the current version is DX9) for $30; if you own Dark Souls II and all the DLC, you can upgrade to the DX11 version for $20. Got it? I hope so, because we're not done yet. The DX9 and DX11 versions will have separate pages in the Steam store, so you'll want to be careful about which one you buy to ensure that you don't either shortchange yourself, or end up with a version you can't run. Furthermore, the two versions of the game are not compatible for multiplayer action: If you upgrade to the DX11 version and all your friends stick with the original DX9 release, you'll be playing without them. "The difference in the DirectX11, Xbox One, and PS4 versions of Dark Souls II: Scholar of the First Sin pertaining to where enemies spawn, items are located, and other environmental differences will not allow players running newer hardware versions to connect and interact with players experiencing the game on older hardware running DirectX9, Xbox 360, and PS3," Bandai Namco explained. The pricing scheme is unnecessarily complicated—borderline bizarre, even—but it's not a bad deal for anyone getting into the game for the first time. Currently, Dark Souls II is $40 on Steam, and the three DLC packs go for another $30 combined, so $40 for the lot is quite fair. Spending $10 more for the DX11 version doesn't really sit right with me, but even that still beats buying it as-is. If, on the other hand, you recently dropped that $70 for the bundle—or worse, purchased the first two DLC packs but haven't yet snagged the third—you're going to get a little hosed if you want to upgrade to the new hotness. Dark Souls II: Scholar of the First Sin hits Steam on April 1. (And no, we're not joking.) Are you in?